It’s been a while since I posted a “Blog” entry – I just haven’t been motivated. However, today, whilst listening to some music, something struck me as possibly very important about my habits and hobbies. On a Podcast17 episode, I mentioned that I listened to the same song over and over again. Nic, the producer, said that he did the same and I wonder how many other people do it. I’m not talking about listening to a current hit and then moving on to something else next month, but serious long-term repetition. I have maybe twenty or thirty songs, some I have been listening to since I was less than ten years old, that I play over and over again. With the advent of YouTube it’s now possible to listen to plenty of remixes of your favourite songs and this is something I have been doing a lot recently. Not only do I love the original song but I love to see how other people can take that central theme and re-work it into something new, yet familiar. Nothing has ever been better than the original, but that’s not to say I don’t really enjoy them. If youa re curious, this is what I was listening to as I wrote this post: Take Five Remixes. I can’t remember where I heard about it (and I think I have mentioned it before, but I can’t find it on the site) but I bought a book called Excersies in style (1947) by Raymond Queneau in which he retells the same very short story 99 times in varying styles. It’s an amazing book and it’s essentially remixing the stories. You wouldn’t think that something so simple: witnessing something on a bus, could allow you such creative scope, but it does. It’s not the story but the view that matters. Where does Black Mesa come in? Regular readers/visitors may know that of all the locations visited in the Half-Life games, Black Mesa is my favourite. I’ll play all sorts of maps and mods but if something is set in BM then that would be my first choice. Yes, I have a deep desire to visit underground bases but I also want to see what other people imagine for the same idea. Any mod I make in the future would definitely be set in a similar place. It’s not just music and settings though. I eat the same food again and again. People think I am crazy: “How can you eat the same food so often? Where’s your sense of adventure?” etc etc. I could even mentioned other areas but I am probably labouring the point. Children, especially preschoolers, love to hear the same story told over and over again. There has been research that suggests this is the best way for children to improve their vocabulary and this makes sense. It can be seen clearly when the adult misses a word – the children often notice (after they have heard it enough times of course). Others have suggested it makes the children feel powerful knowing what is coming. I don’t know if the “power” idea is true but what doesn’t seem to have been addressed or researched is WHY the children love it. Repetition is vital to improvement, in any field of endeavour, but rarely do children, or adults for that matter, relish such extended repetition. These children don’t ask you to re-read stories again and again because it’s good for their vocabulary, they do it because they freaking LOVE to hear the stories. I’m not a parent but I have read “Goldilocks and the Three Bears” many, many times to relatives’ children, so I speak from some experience. Is it simply a case of loving something so much that one just wants to repeat it with small variations? I think so. It’s strange that I never really played the games more than a couple of times and I certainly don’t like replaying mods either. In fact, I rarely re-read books or films and if I do I normally leave it at least ten years between readings/watching. So, maybe it’s more complicated that that. Clearly, this is a general theme that has deep meaning for me and it doesn’t take a psychologist to see that’s probably where my desire to run the *Ville competitions/challenges comes from. Wanting to see variations on the same theme. I’d love to hear your thoughts and experiences on this matter. 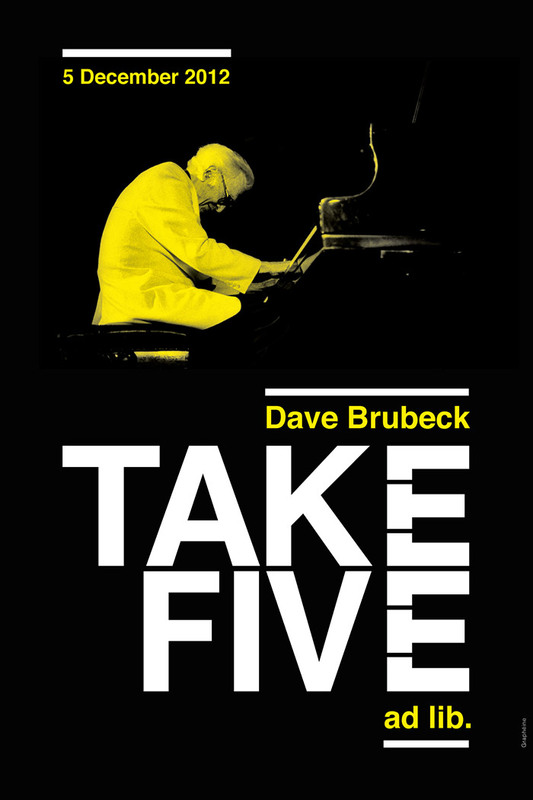 I was listening to Dave Brubeck’s Take Five when the idea of this post occurred to me and I decided to sue the album cover, from which the song comes, as the featured image. It’s called Time Out and was released in 1959. I love “design”. Whether it’s maps or mods, physical products, logos or even posters. I found the poster below when I was looking for images to use as the header. Just look at how the two Es have been turned into a keyboard, which is the instrument that Dave Brubeck played. Very cool. I too like remixes, though mine are more Vocaloid in taste! I like Black Mesa themed mods; It always feels like returning home! I guess I’m a Half-Life Otaku! Black Mesa Source felt like a true fans interpretation of a much loved game, with some remixed stuff added for the player’s betterment! Some revisits are bad though. There’s a film on the TV with a modern themed T-Rex with proto-feathers! Some things shouldn’t be remixed! Actually, the ‘dinosaurs with feathers’ thing is based on fact – most scientists believe that dinosaurs really did have feathers – which explains why it’s seeped its way into recent films. You’re right in saying they shouldn’t though… It just looks silly. With Jurassic World coming out later this year, I’ve been seeing a lot of the opposite complaint – why don’t the dinosaurs have feathers? I actually like how the series has stuck to its guns about not adding them, but I think the fiction provides an excuse as well: Jurassic Park dinosaurs aren’t purely dinosaurs.